Stories that take placein or are about the city of Mississauga. July 15, 2011. 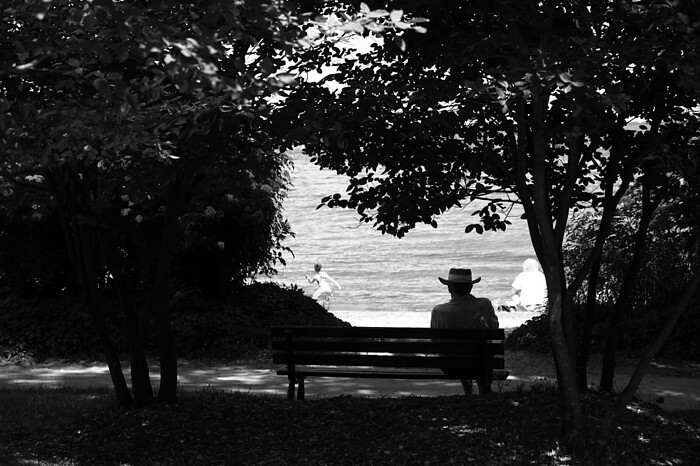 A man sits on a bench in the shade, with a view of the beach at Jack Darling Park, Mississauga. September 20, 2010. This pair of condo buildings in the "Absolute" development at the corner of Hurontario and Burnhamthorpe in Mississauga is really coming along quite nicely. I work right nearby, so I've been watching these things slowly rise and take shape. The architecture is fantastic, daring, and definitely eye-catching. Because of their location and size, you can see them from very far away in almost any direction. They're already dominating Mississauga's skyline and they aren't even finished yet. 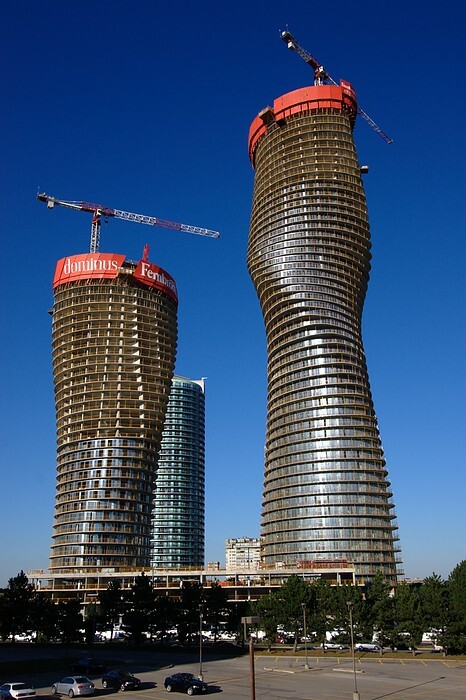 These are practically Mississauga's CN Tower. More of my own photos, from ground level, are here. Did anyone else have an awesome bike commute this morning? I sure did! I don't often look forward to biking 20km to work in the rain, but today was amazing. It was 11 degrees outside, and a light rain when I left my west-end home at about 8:40am (yeah, I was running late!). I was dressed a bit lighter than I usually would in January: underwear, MEC Rad Pants, long sleeve light "Powerdry" t-shirt, rain jacket, wool socks, Shimano cycling sandals, and rain booties. It was actually colder in my garage than it was outside. As soon as I got into the alley, I knew I'd be shedding layers soon. Riding along Annette St., I was opening up my cuffs and unzipping the top of my jacket for more air. By the time I was around Dundas St. and Royal York, I had the pit zips open. The headwind was very light, barely noticeable. I was flying along. I think I ride faster when I'm in a really good mood too. Warm January days do that to me. Burnhamthorpe Rd., somewhere in eastern Mississauga. Really cookin' now, and even my feet were feeling hot! I stripped off one of my booties and shoved it in my pannier's rain cover. A few intersections later, at another red light, the other booty came off and now I was riding in a stylish combination of wool socks and sandals. I hiked up my Rad Pants to let my ankles and calves breathe more. At the next red light, Dixie and Burnhamthorpe, I completed my transformation into a summer cyclist by taking off my jacket and rolling up my sleeves. The final 4.5km to work were the best. Starting with the downhill from Dixie Rd., I was grinning like a madman as I pushed my way towards the centre of Mississauga. The people cooped up in their cars probably thought I was nuts. I think they're nuts. The rain was picking up a bit now too, but I didn't care. I was having too much fun to be annoyed by it. Hell yeah. Bikes rule. Can't wait for the ride home! Cross-posted to I Bike T.O. Sometimes the best ideas are the simplest ones. There aren't many better ways to end a day at work than taking the "Long Way" home on your bike! The Long Way Home is something I try to do often, but not often enough. I commute almost every day by bike, and almost always enjoy it, but sometimes it's nice to see something else besides the same stretch of Bloor St. I often shake it up a bit by riding various sections of Rathburn Rd., Burhamthorpe Rd., or when I'm feeling more ambitious I'll ride all the way down to the lake and then head east. That's what I did today. I just took off straight down Hurontario St. to Port Credit, and then took the slow, meandering Waterfront Trail route back to Etobicoke. Of course I stopped at many places along the way to take some photos and just enjoy the spring evening. The long evenings, warmer weather, and awesome sunsets make Spring an amazing time of year to "take the long way home". I'll have to do this as often as possible. How about you? A bunch of photos from my ride are posted here. I covered quite a long distance on my bike on Thursday, especially for a regular weekday. Almost 70km. My usual commute to work was followed by a ride out to the depths of North York for a memorial for a 16 year-old cyclist named Bianca Gogel who was killed by a truck last week. Although the main destination for all this riding was to attend a sad memorial, I wanted to make the best of this nice riding weather and enjoy myself. The pictures tell more of the story. On the morning of Wednesday March 29 2006, 46 year-old Andrzej Sacawa was riding his bicycle westbound on Burnhamthorpe Road over the Credit River bridge in Mississauga. His handlebars struck the railing, causing him to fall off his bicycle and over the railing to the river below. Paramedics pronounced him dead at the scene. This story struck a nerve with me for several reasons. The first time I rode my bike out there, I noticed the very low railing and thought to myself, "This is dangerous! How can this be part of the Burnhamthorpe Trail system?" Yes, this bridge with a railing that is only 38 inches high is part of a cycling route. The other reason why I was bothered with this incident is that the city of Mississauga seemed to put the blame on Mr. Sacawa for riding his bike on the sidewalk! I rode along the Burnhamthorpe Trail to the Credit River Bridge to survey the scene. In my opinion, the "trail" provides cyclists a false sense of security by separating them from traffic, while funneling them onto sidewalks and over bridges with low guardrails. Please click here to see my photos and read my commentary about this trail and bridge. Advocacy for Respect for Cyclists (ARC) has followed up on the incident by holding a memorial, calling for a formal coroner's inquest, and demanding an apology from the city of Mississauga for creating a dangerous situation and blaming the cyclist for his own death.